Grey is a very popular color now and it has never been a favorite of mine. Working with this grey and purple has been fun, though, and I may be a new convert! 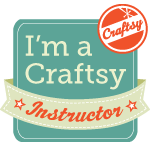 My Craftsy Class Has Launched and Here’s a Discount Code! Whoo-hoo! 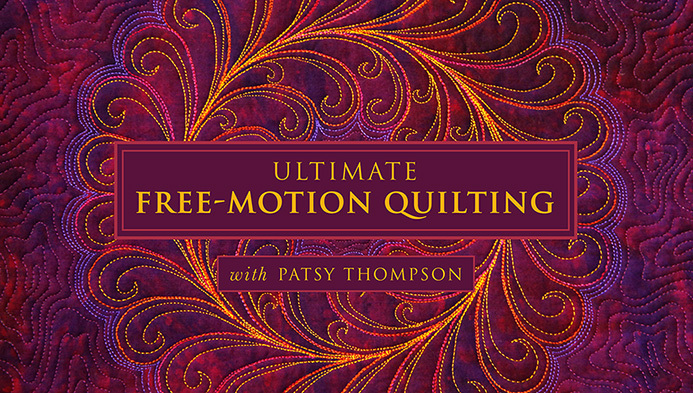 My Craftsy class “Ultimate Free Motion Quilting,” is now live! 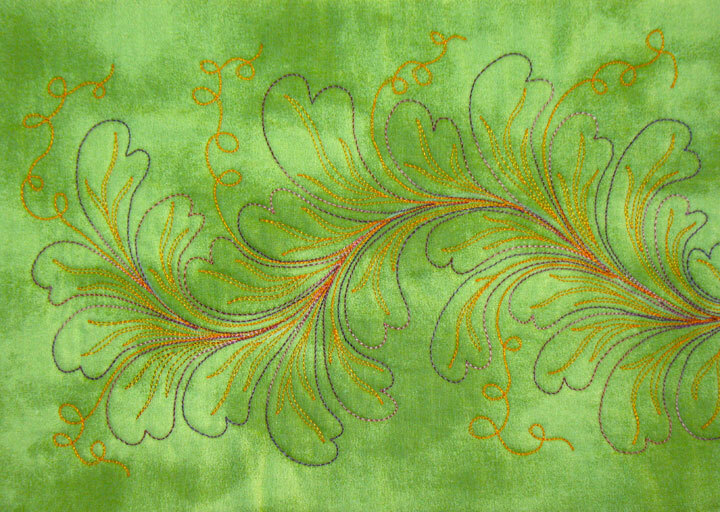 Please join me for a fun and informative class to crank up your free motion quilting another notch! If you’ve got some basic free motion quilting skills, I’ll walk you through a few different trapunto techniques to add texture and dimension to your quilts. I’ll take you through the basics of hyperquilting, and then walk you through some progressively more complex hyperquilting techniques. To top it off, I’ll show you how to couple trapunto and hyperquilting together to create a jaw-dropping trapuntoed feathered wreath! 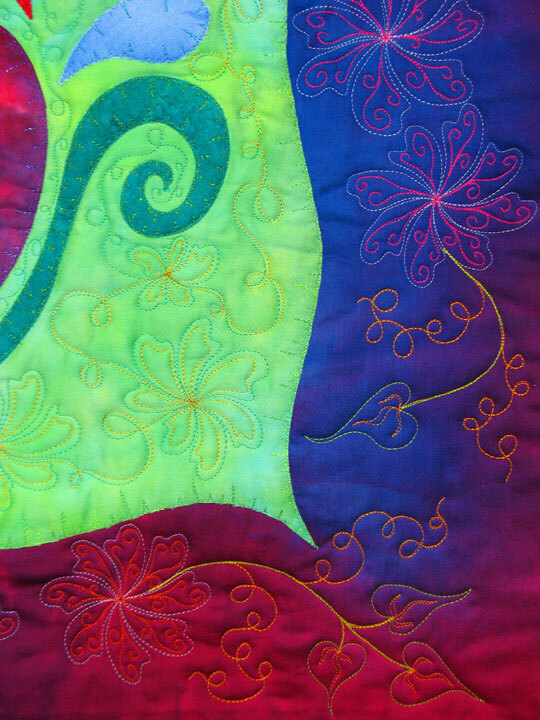 Learning these kinds of skills will take your free motion quilting to a whole new level. 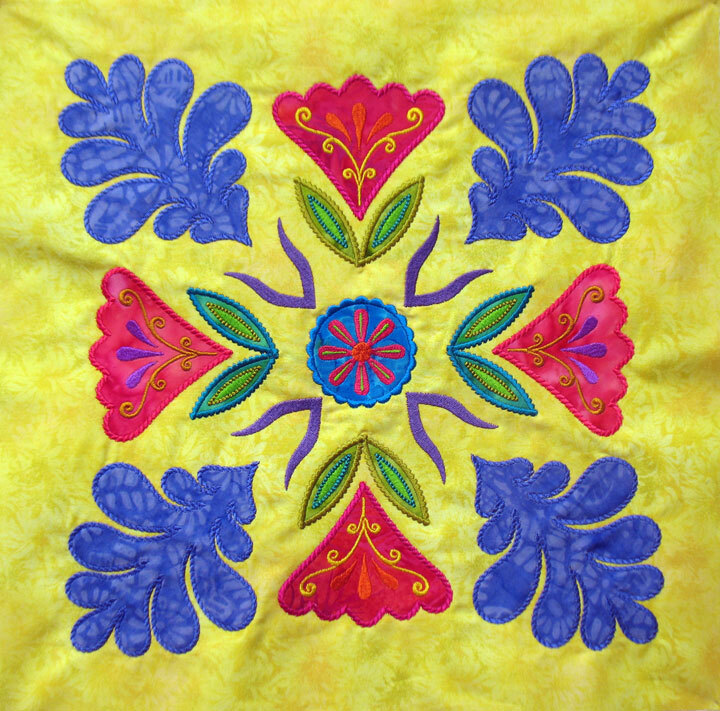 There is SOOO much you can do once you start playing with hyperquilting and trapunto! Don’t talk yourself out of being able to do “ultimate free motion quilting…” jump in with both feet and life will never be the same again! Better yet, click here for the discount code to save yourself some $$ on the price of the class! See you in the classroom! Rulers, Templates, Embroidery Needles and Great New Patterns! Are you looking for a great new ruler or template to add to your arsenal of tools? We have new Handi Quilter Wave Rulers, you aren’t going to want to miss. Check out some of our great new additions below! The products in this newsletter are all new, so for the first week in the store we will be offering most of them at a reduced introductory price. You will not need to enter a discount code to receive these introductory savings and the prices are valid until July 25, 2014 at 9 am, E.S.T. *Please note we are not allowed to offer some products at a discount. Remember that each and every retail purchase that you make in our store is being tabulated to count toward a gift certificate you may use for a future purchase. We also offer free shipping to US customers on orders over $10.00 and a discount for our International Customers. This is our way of thanking you for being a loyal customer. Please make sure you are logged into your account when making a purchase to properly track your points. Made from .25-inch thick quality acrylic. Use the HQ wave to make spines for feathers and other designs. This ruler makes a 12-inch wave from peak to peak and makes either 1-inch or 2-inch deep waves. Rulerpackaging includes instructions for use, safety tips and design ideas. Use with the HQ Ruler Base. One multi-size acrylic tool with guidelines for cutting 8 sizes of the Windmill shape. Instructions included for cutting pieces so they are automatically on the proper grainline, playing Leap Frog, chain piecing, and making joining rows. One multi-size acrylic tool with guidelines for cutting 7 sizes of the classic Tumbler shape. The smallest is just the right height for 2-1/2in strips. The largest finishes at 6 inches high. Perfect for scrap quilts. Perfect thimble proportions, which is why this pattern also called Thimble. The Fan Favorite Quilt Blade Template is used in making the Fan Favorite and Scrappy Tidbits quilts found in the book, Embroidery & Patchwork Revisited (L11314) The 7-blade fan works into a 4-1/2in finished square. The fan blocks may be embellished with stitches. Sparkling clear acrylic stencil for creating perfect 8-pt stars. Can make stars in 5 sizes from 3-1/2in to 8in. It can be used to create stars blocks that have 22.5, 45, and 90 degree angles. It can be used to trace PlumEasy’s Folded Star Hot Pad positions or the new EasyStar block. Included in box: Embroidery Gold needles sizes 75/11 (item 1824) and 90/14 (item 1825), embroidery assorted sizes (item 1742) and embroidery Twin needle size 3.0/75 (item 1736). Also included – sample spool SulkyPolylite thread and Schmetz ABC Pocket Guide in reusable hinged box. Included in box: Needles – Quilting size 75/11 (item 1735), Quilting size 90/14 (item 1719), Microtex size 70/10 (item 1729) and Topstitch size 90/14 (item 1793). Also included – sample spool Sulky Polylite thread and Schmetz ABC Pocket Guide in reusable hinged tin. Included in box: Needles – Universal size 70/10 (item 1708), size 80/12 (item 1709), size 90/14 (item 1710) and size 100/16 (item 1778). Also included – sample spool Sulky PolyLite thread and Schmetz ABC Pocket Guide in a reusable hinged tin. 5Baby 40-1/2in x 54in, Lap 54in x 67-1/2in, Throw 67-1/2in x 81in, Twin/Full 81in x 94-1/2in, Queen 94-1/2in x 108in, King 108in x 108in. Filed under Site Updates. Comments Off on Rulers, Templates, Embroidery Needles and Great New Patterns! 2. It has a 100% polyester batting. Polyester is a very smooth batting as compared to a wool or cotton batting so it doesn’t “grab onto” the fabric at all and instead is kind of slick so it can move a little. This same long armer has basted a couple quilts for me before with the same amount of basting, but those quilts all had wool battings and wool has small barbs that like to grab onto things. You can see that I left the cornerstone blocks of that border blank. I’m still trying to decide if I should stitch something in there or just leave them blank. They are very small and I don’t want to put anything in there unless it will add something worthwhile to the overall design. There’s a ton more quilting to go on this baby but if I keep focused, I think I could actually finish this quilt in the next 2 months. It’s good to have an end in sight! Wow…Ultimate Free Motion Quilting!!!! Don’t you just love that title?! Anyway, I’m going to give away a free class to some lucky person. 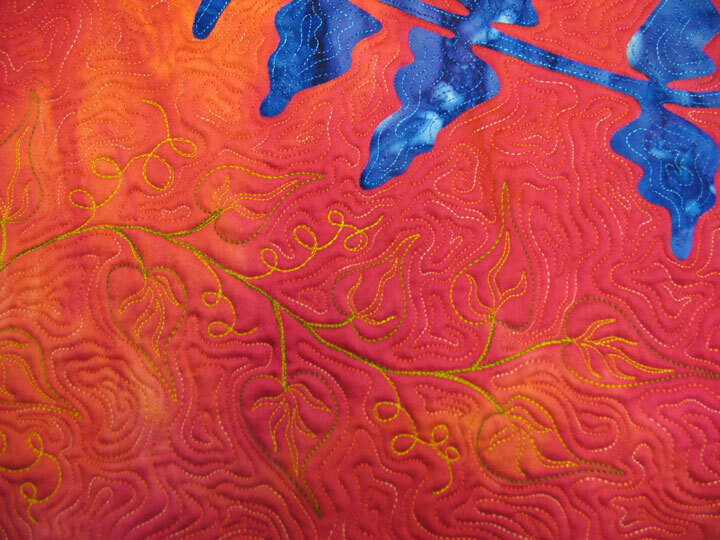 All you have to do to enter is write a comment to this blog post telling me what you’d like to learn in the world of free motion quilting. Comments need to be made by 5 pm eastern daylight savings time on Tuesday, July 22, 2014! THIS GIVE AWAY IS NOW CLOSED…THANKS TO EVERYONE WHO PARTICIPATED! The winner was Heather J!